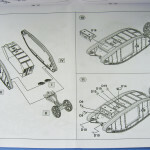 Contents and Media: Injection molded kit, small photo etch detail set, rubber treads. Advantages: Replaces the old Airfix kit with state of the art. 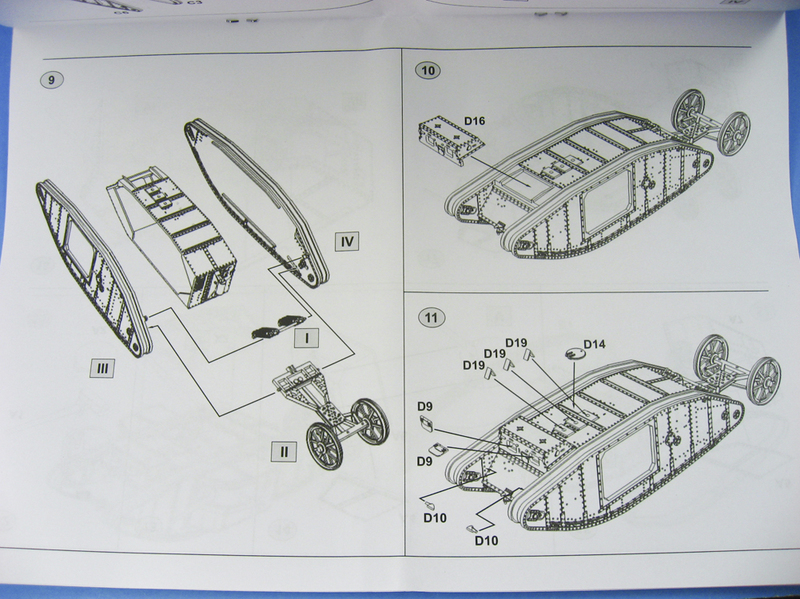 Assembles very quickly with few gaps. Few parts, yet very detailed. The photo etch for the grenade screen is a nice touch. Disadvantages: The plastic is a bit brittle, which doesn’t cause many problems overall, but removing the very tiny periscope covers without breakage was near impossible. Recommendation: Recommended for WWI tank fans, and anyone who wants to try their hand at armor. 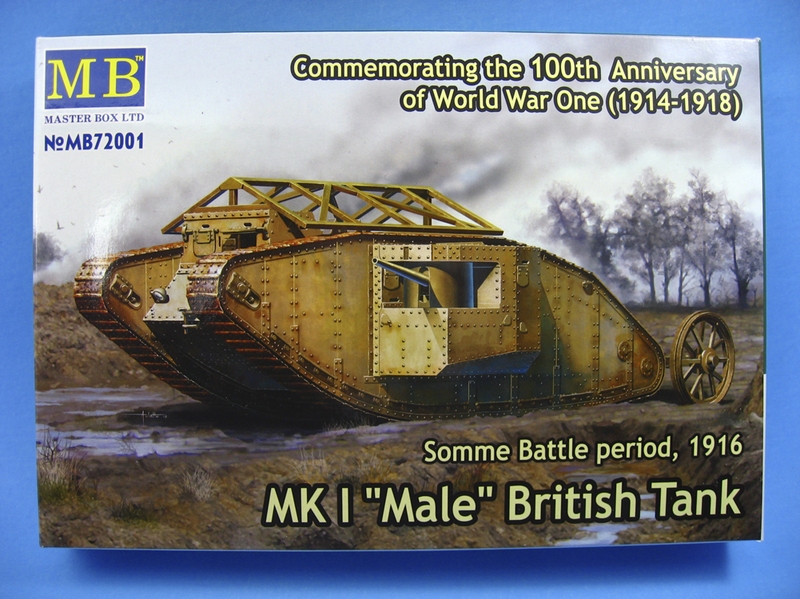 The MKI is the first vehicle in the world to be called a “tank”. It grew out of two needs: to protect advancing troops, and to cross trenches. As one can imagine, this new weapon met with initial difficulties as the kinks were worked out, but the overall design was sound enough to evolve up through the MK V. Approximately 150 MK Is were built during the war. 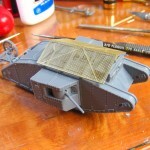 I’ve built little armor, but the MK I tanks have always fascinated me. They’re ugly, brutish, dirty and beat to hell. All the things I look for in modeling subjects. There are only three sprues for the main kit parts, which number about 40. 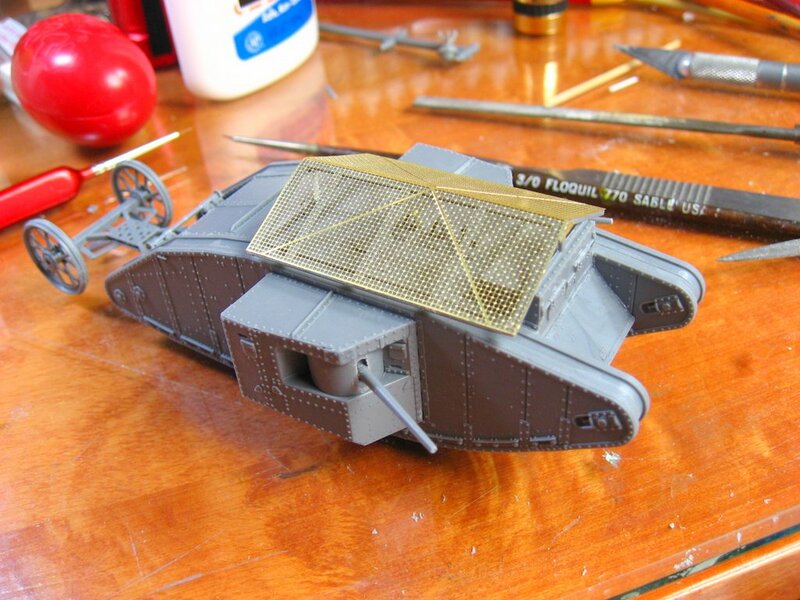 The treads are rubber (a test shows they hold acrylic paint well), and a small photo etch fret that has some tiny details and the anti-grenade screen that goes on top of the vehicle. 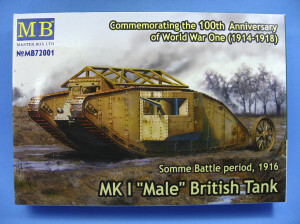 This is the Male version of the tank, and MB have released a Female version of the tank as well. I’ve actually completed construction on the kit several weeks ago. It’s sitting in my airbrush booth waiting for a day that’s warm enough to open a window and vent the booth for airbrushing. Very detailed, minimal parts, and builds really fast. This kit is a winner. I have only 2.5 hours into the build on this kit; the speed due mostly to the fact that it goes together with zero seams. Fit is fantastic. Retail is $28.50, but I see these in hobby shops and online for $21-$24 dollars. An amazing value for the cost. MB has already released two more versions of the tank, and I can only hope they’ll move onto more Land Ironclads in the future.